Written by Admin on June 12, 2018 . Posted in Skin Care. Most people tend to flinch at the thought of peels! Just the thought of a fiery red face, with skin shedding off like a snake in the desert…. but this is not always the case! We do perform peels like this but the fact is most of the peel treatments we do perform are extremely controlled and are definitely not suited for all. The common peels that are used in clinics are designed to ‘treat’ the skin and perform a mild ‘peeling’ of the skin, basically a deep exfoliation (much like microdermabrasion), but instead of a physical exfoliation it’s a chemical exfoliation using specific acids to dissolve all of the dead skin cells and debris. The most commonly used acids are AHA’s and BHA’s (Alpha hydroxy Acids or Beta hydroxy Acids). These sound scary but are actually either fruit or lactic acid (AHA’s) or Salicylic Acid which comes from Willow Bark (BHA). These are actually quite mild superficial peels and for most skins there is no downtime required after a treatment. The reason we have a lot of different acids to use is they all treat a specific skin type or skin concerns. What Type of skins need peels? All skins benefit from peels but peels are very popular for treating most forms of acne. Acids such as Mandelic Acid (from the Bitter Almond) have strong antibacterial properties and also help to regulate oil production. A series of peels + some other modalities like light therapy (Read Here) can treat acne successfully. 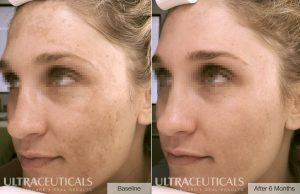 For those with pigmentation/sun damage concerns, peels can aid in the reduction of your pigment. Especially those who cannot be treated with other pigmentation treatments such as laser or photo rejuvenation. This is due to the fact that pigmentation caused by hormones simply doesn’t respond to light or laser. We recommend Ultraceuticals Brightening Peel which contains a powerful blend of 8 brightening ingredients. Peels can be a great treatment for early signs of ageing. As the skin ages our natural desquamation (exfoliation) process slows, meaning we are left with a build-up of dead skin cells, dirt and oils on the skin’s surface. Peels help by speeding up our cell renewal process, some peels are also designed to hydrate the skin which is a crucial part of anti-ageing treatments. We recommend a Lactic Peel for those with ageing concerns. 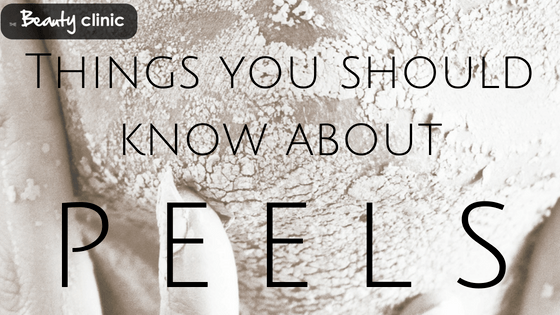 For most superficial peels you shouldn’t feel much at all, some tingling is normal and the skin could feel quite warm. Some skins that may have an impaired barrier or who are not well tolerated to active ingredients may feel a lot more stinging but this does not last long. We recommend adding a mask post peel to put hydration back into the skin and prevent any peeling. We use mesoestetic® Post Peel crystal fiber mask. This is the ultimate post peel mask as it instantly cools and soothes the skin and also hydrates that fresh new skin we have revealed with our peel. Your skin may be flushed or red, the skin may feel tight and even itchy. We will give you a full set of post care instructions which are important to follow. In the days following your peel you may have some peeling and flaking (usually around the nose and mouth) just make sure your skin is well hydrated and this will soon disappear. The result after a peel is soft, glowing, fresh looking skin. How many should I have and when? How many peels you need depends on your concerns and what results you would like to achieve; your skin therapist will recommend how many peels you need. The best time to have your peels is winter, as there is less sun to cause UV damage to the fresh new skin. As there is less moisture in the air our skin becomes very dehydrated. Also, naturally our cell renewal slows in winter and dead skin cells begin to pile up on the skin’s surface making our skins appear very washed out and dull. Peels are the perfect way to speed up our cell renewal, hydrate the skin and tackle any other skin concerns like pigmentation and acne. I’m worried I may react? If you have reacted to products or treatments in the past we understand your fear of putting product on the skin. If you have reacted in the past or have a sensitive skin we encourage you to have a patch test performed before you go ahead with the treatment, we are more than happy to test you.